Who doesn’t love a gift all wrapped up in a reusable mason jar? I’ve rounded up more than 35 of the best ideas for gifts in a jar for everyone on your list from grandma & grandpa to kids. These gifts work for Christmas, birthdays, and more! Find lots more easy and doable DIY gifts like these mason jar gifts on our Handmade Gifts page where you’ll find tried-and-true ideas for all the people on your list. 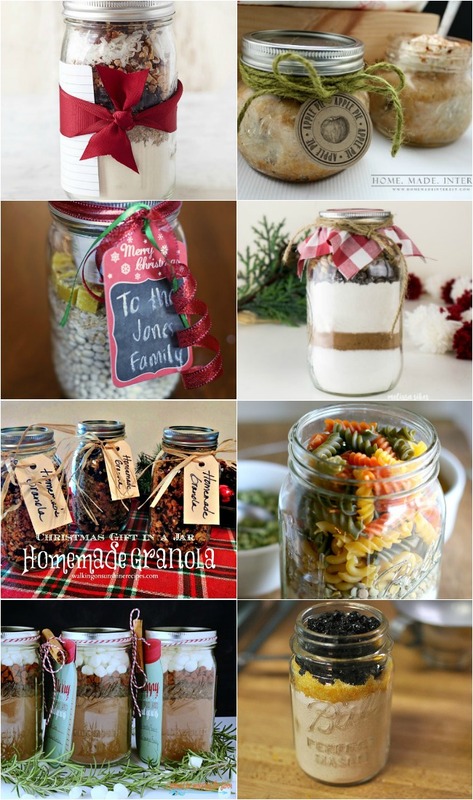 The mason jar may just be the perfect container for all kinds of gifts ranging from food (didn’t the cookies-in-a-jar start it all? ), to beauty, home, and even multiple items for a customized “mason jar basket.” Many times you can present a gift in a jar as-is, no wrapping required. You can also add them to baskets with a few other items, or simply drop them in a gift bag. Not only is the gift inside the jar, but it’s also the jar itself, since they can be reused for many, many things (storage containers, lunch “boxes,” soap holders, leftover containers – and yes, even for canning sometimes). Colorful leakproof plastic storage lids with marker. Pop-Top drink, pour, and store lids. Drink lids for use with or without a straw. Shaker lids with silicone seals (these would be great for gifting spice mixes!). Sprouting screens and rings (add some sprouting seeds, directions, and you’re done). Oil pour spout dispenser with caps for mason jar lids (add the oil and vinegar to a salad basket). Erasable chalkboard mason jar lids (perfect for writing the contents of the jar on top). Sip and straw lids with reusable straws (add to a kid jar just for fun). Cold brew coffee maker with flip cap lid (add this to your coffee lover jar). Rust-proof soap dispenser lids and foaming soap dispenser lids (for your own DIY foaming soap using the recipe below). I’ve given – and gotten – many gifts in a jar over the years and they remain some of my favorite and most useful. They are also usually pretty inexpensive which makes it easy to give to everyone on your list without busting your budget. 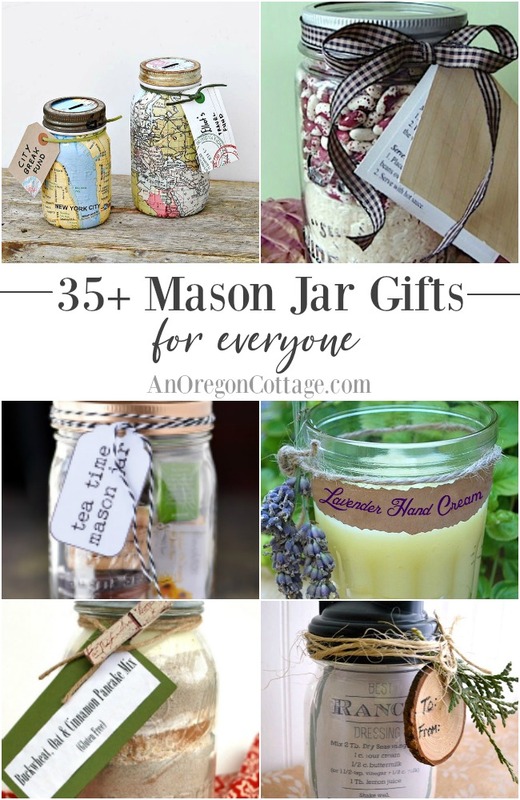 Here are more than 35 mason jar gift ideas I rounded up for you, ranging from food to jars you can give to kids, men, and people of all ages. 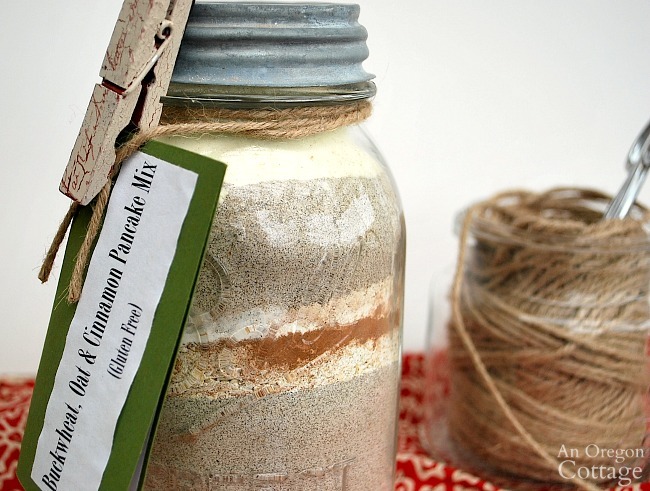 Gluten Free Buckwheat, Oat & Cinnamon Pancake Mix Gift in a Jar + Printable Tags. A delicious breakfast addition, these pancakes are naturally gluten free because they’re made only with oats and buckwheat flour. Gift in a Jar: Cinnamon Oat Pancake-Waffle Mix. These pancakes are amazing. 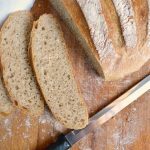 Really – you may want to make a batch just for yourself! But everyone will love them, too – these would be for the people on your list who can have gluten. Pair this like I did with a couple of homemade syrups and a whisk or give as-is. 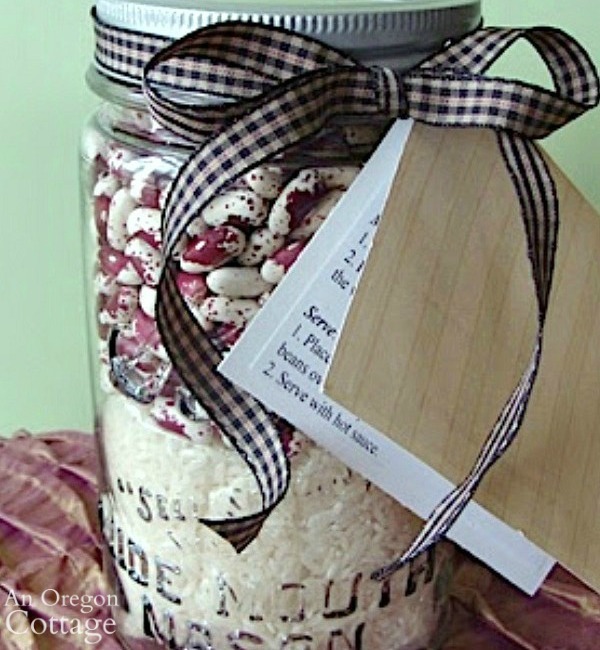 Red Beans And Rice Gift In A Jar + Free Printable Tags. If you’re looking for something other than cookies or soup to give in a jar, try this fun red beans and rice. You simply add rice, beans and a seasoning packet – easy and inexpensive! Rosemary Focaccia Bread: Handmade Gift In A Jar + Printable Tags. Here’s another option for a different type of food gift in a jar – an easy focaccia bread. This makes a nice accompaniment to the red beans and rice (or soup in the links below), but it’s also nice on it’s own, maybe with some small bottles of olive oil and balsamic for dipping. 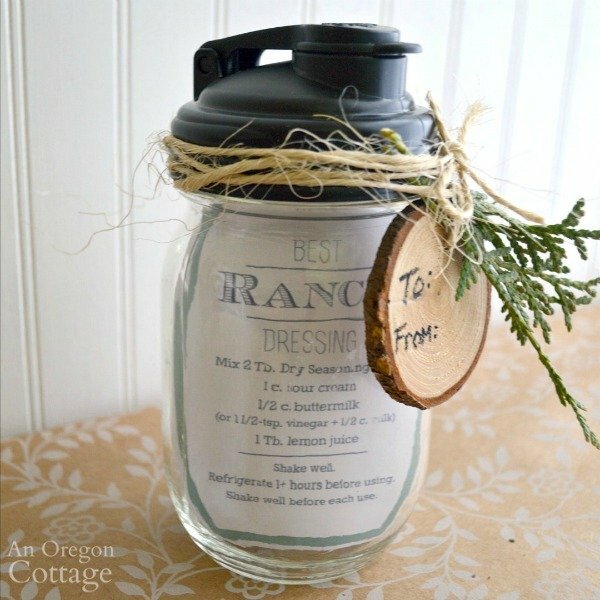 Ranch Salad Dressing Mason Jar Gift in a Jar. Talk about an easy and useable gift – you give all the spices, recipe, jar, and special pop-top lid and they get just about the best ranch dressing around. 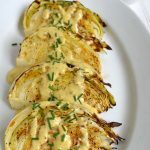 Plus, it’s their’s to use for any other dressings or sauces later. Toffee-Pecan Cookie Mix @ BHG. I give cookie plates at the holidays, but it’s nice to also give a gift of cookies that people can bake whenever they want. Apple Pie in a Jar @ Home Made Interest. These are just plain fun – who wouldn’t love an apple pie in a jar? White Chicken Chili in a Jar @ Everyday Reading. I love giving food gifts that are healthy and helpful – like this chili ready to go with a can of green chilies included! 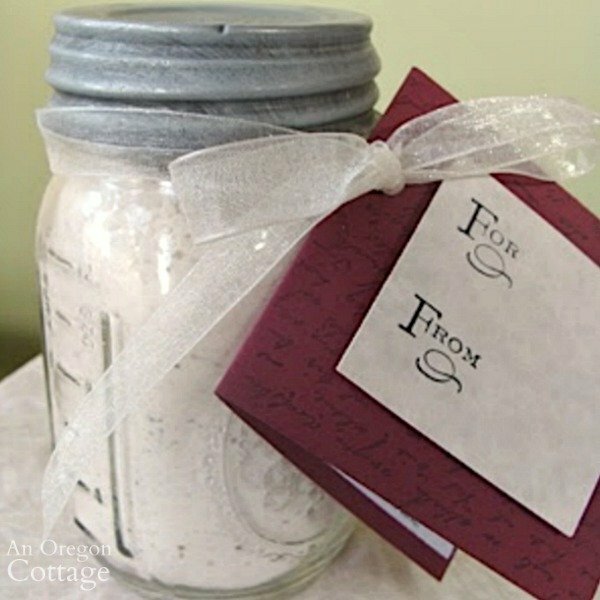 Brownie Mix in a Jar Gift with Free Printable Tag @ The Happier Homemaker. If you have a chocolate lover on your list, this is a good bet. Homemade Granola Christmas Gift in Jar @ Walking on Sunshine. I always like to say that gifts don’t need to be complicated or expensive, and this proves it. 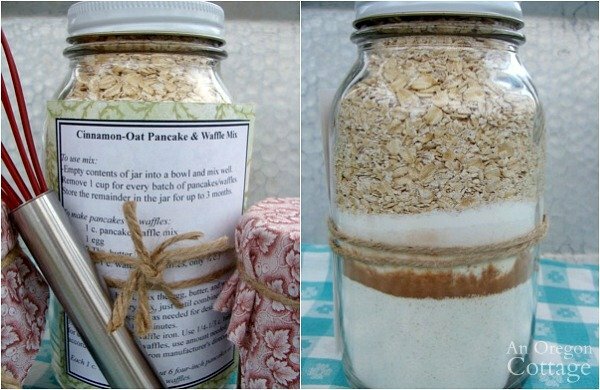 Fill a jar with homemade granola (I’m partial to my recipe, of course), add a lid and tag and you’ve got a great gift that will actually be used. Friendship Soup In A Jar Gift @ Oh My Creative. I like this idea of combining soup and friendship – it’s a great gift that you could give at any time to your friends. Spicy Mexican Hot Cocoa Mason Jar Gift @ Today’s Creative Life. Love that this is a different type of hot chocolate! Cranberry Orange Scone Mix in a Jar @ Food In Jars. Scone mixes are some of my favorite gifts – and this recipe actually has fresh citrus peel included. 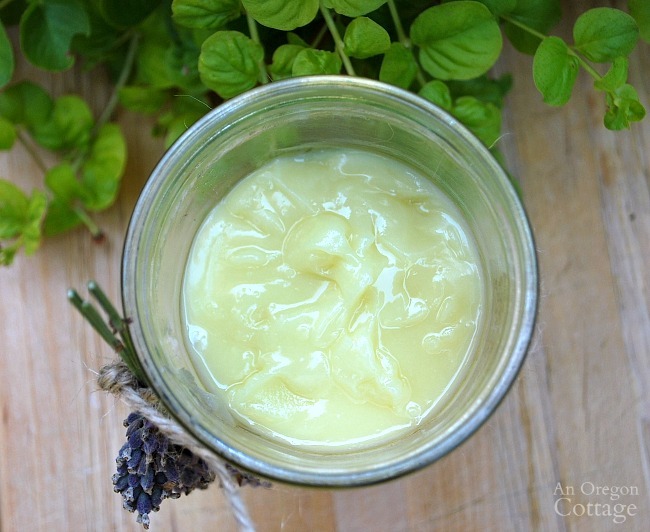 Easy Homemade Hand Cream for Gardeners. All natural and easy to make, this is for serious gardeners who know how rough their hands can get (or anyone with dry hands). DIY Liquid Foaming Soap in Jar Dispenser. 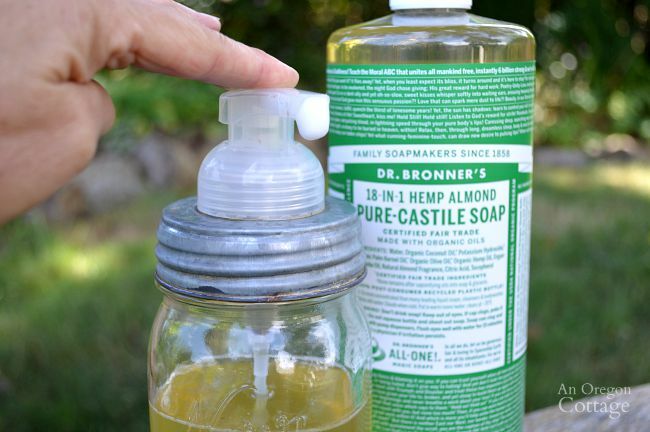 Did you know you can make a good foaming soap with pure Castile soap? You can and it’s the easiest thing ever! Package this in a jar with one of these lids from the list above and you’ll be set. 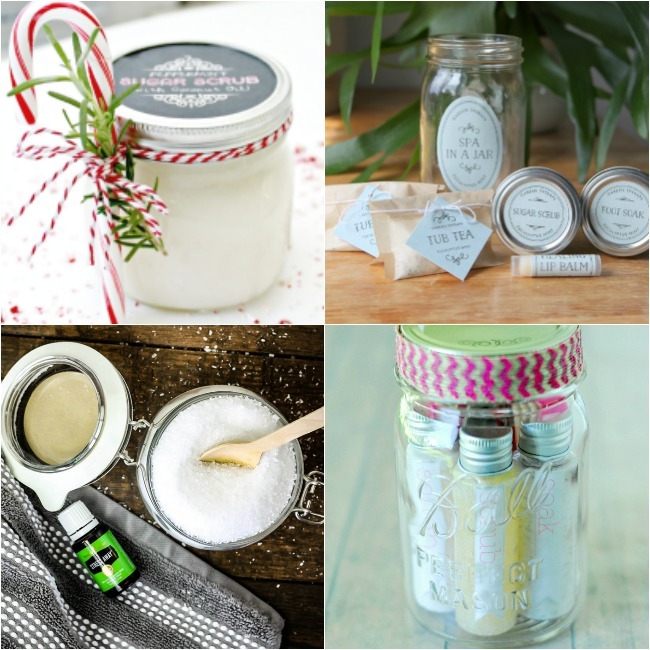 Peppermint Sugar Scrub with Free Printable Labels @ Mom 4 Real. You can’t go wrong with a nice scrub and if it’s a holiday gift, peppermint makes it that much better. DIY Spa In A Jar @ Garden Therapy. Give the gift of a spa in a jar to someone who could use a some pampering. 2 Ingredient Relaxing Bath Salts @ The Shabby Creek Cottage. For the person on your list who would enjoy a little relaxing time. Pedicure In A Jar @ The Gunny Sack. So creative and you can customize it however you want with the colors you know your recipient will like. DIY Paperwhite Bulb Mason Jar Gift @ The Happier Homemaker. For gift-giving, I would make this in a taller jar with the bulb halfway down. Then you could add a lid for giving and the taller jar would provide some stability for the bulb as it grows (paperwhites are notorious for flopping as they grow tall). Soy Beeswax Jar Candles @ Garden Therapy. Candles in jars are sold all over – how about gifting some natural ones you make yourself? Mason Jar Oil Candle Lamp @ Hearth & Vine. All the directions are included for making, gifting, and using these beautiful oil lamps. So unique! DIY Christmas Potpourri in a Jar + Free Printable @ Yellow Bliss Road. I love how this uses a whole orange and fresh cranberries – what a lovely hostess gift this would make. 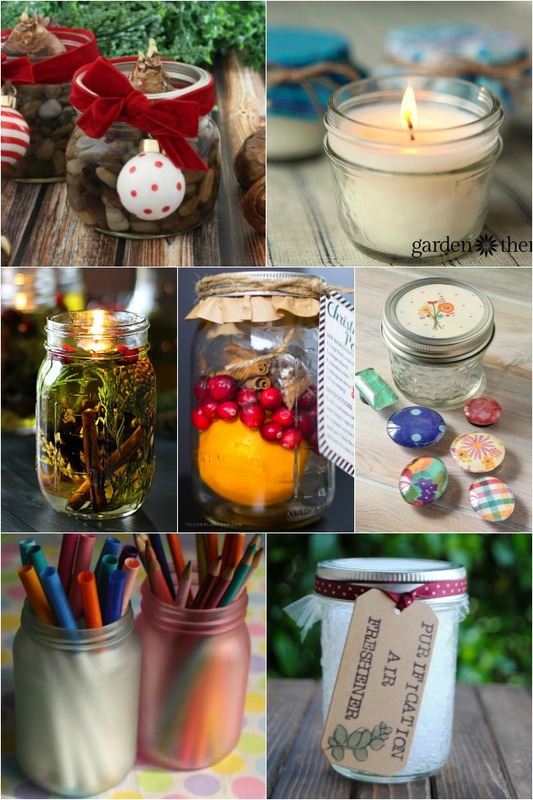 Easy Handmade Magnets in a Mason Jar @ Mod Podge Rocks. You can put a lot of things in a jar – how about some adorable DIY magnets? How to paint a mason jar with a frosted finish @ Happy Hooligans. I just had to add a tutorial for painting mason jars because then you can make them into almost anything – storage container, candle holder or vase. You’ve got options here. DIY Mason Jar Gel Air Fresheners @ Shaken Together Life. These would make such an awesome gift! Air fresheners are often full of things I’d rather not inhale, but this is made with essential oils and water absorbing crystals. Perfect Shave in a Jar Gift @ Creative Ramblings. As long as the men in your life don’t have beards, lol, this homemade shaving cream gift would be perfect. BBQ Rub Gift in a Jar @ The Country Chic Cottage. Spice rubs are a go-to for men’s gifts – and for good reason. They are delicious and will actually get used. Add the shaker tops from the list above to make it even better. Mason Jar Gift for the Paint Lover @ Pet Scribbles. The artistic person on your list will appreciate all the thought and care that goes into creating a mason jar gift like this. Book Lover Gift in a Jar @ The Country Chic Cottage. Got a book lover of any age to buy for? This is a clever way to make a gift card seem more special. 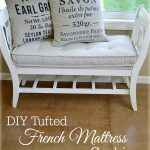 DIY Mason Jar Sewing Kit with Free Printable @ the Polka Dot Chair. Anyone who sews – and those who don’t but often need a pin or needle for quick clothing fixes – will enjoy this all-in-one-place sewing kit. Boredom Buster Mason Jar @ The Gunny Sack. I love the idea of this gift in a jar – fill it with little interesting toys and things to get any kid out of the “I’m bored” mode. Teen Boy Gift in a Jar @ 504 Main. Up your gift-card game with this fun jar. Teen Girl Mason Jar Gift Idea @ Our Southern Home. And do the same for the teen girls on your list. Map Mason Jar Bank @ Pillar Box Blue. I love, love how these map jar banks look, all vintage and cool. I can think of a ton of people – both young and old – who would enjoy these. Tea Time Mason Jar Gifts @ The Gunny Sack. Give the gift of tea in a jar. Coffee Lovers Gift in a Mason Jar @ Town & Country Living. Or make it coffee for those who love it. 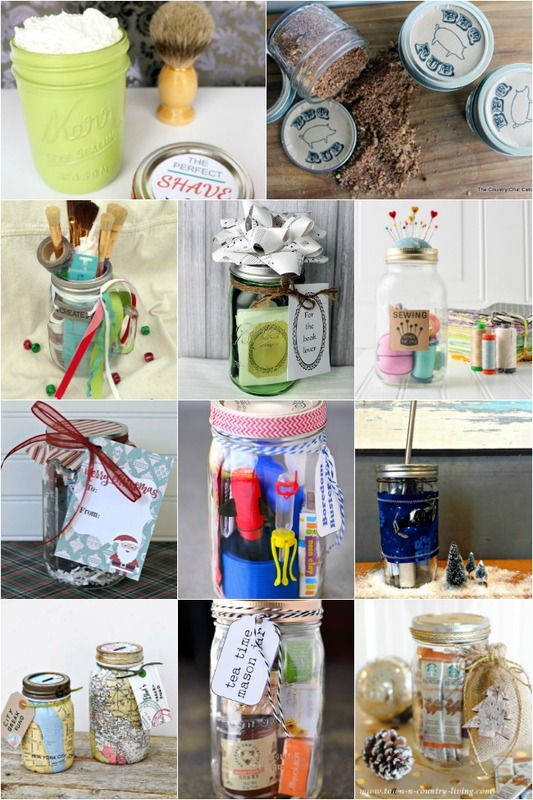 I hope you’ve been inspired to make your own DIY gifts in a jar for your friends and family. I know I have! If you’d like even more handmade gift inspiration just click over to the Crafts and Handmade Gifts section of AOC where you’ll find a ton more easy DIY gifts. Keep up to date, get access to a library full of freebies, and get the weekly newsletter full of behind the scenes and useful info by filling out the form below and become an AOC VIP!